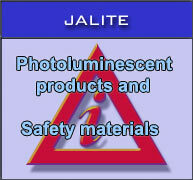 JALITE PLC has been supplying photoluminescent products and materials for the safety industry since the early 1970s. JALITE PLC manufacture photoluminescent fire safety signs, means of escape signs and health & safety signs as well as other photoluminescent products for safety applications worldwide in a wide range of languages. Other photoluminescent products include paint, tape, photoline matting and safety wayguidance systems. Specialist IMO signs are manufactured for marine and offshore companies.